Complete the Pilgrimage of the Nine Divines to show that you are worthy. This quest only becomes available once you have installed the Knights of the Nine official plug-in. Speak to any NPC to learn of a Prophet in Anvil that's creating quite a stir with his foreshadowing. Head to Anvil and speak with The Prophet to learn about the Attack on the Chapel of Anvil. Visit one wayshrine for each of the Nine Divines. On the last wayshrine you pray at, you will receive a vision and start the next quest. After downloading and installing the plug-in, ask any NPC about "Rumors" and you may learn about the attack on the Chapel of Dibella in Anvil. You may also notice a new dialogue option regarding some sort of "Prophet". Asking about him will yield information about a man in Anvil who preaches that the attack on the Anvil Chapel is merely a sign of things to come. Asking about either of these options, or traveling to Anvil and speaking to the Prophet directly will add this quest to your log (the first of many). Additionally, talking to any citizen in Anvil will give you more information about the attack. Whatever path leads you to Anvil, the Prophet can be found across the road from the Chapel of Anvil, in the garden next to Benirus Manor. During the day, he rants about the attack on the chapel, saying a threat has emerged from the darkness of the ages of myth to challenge Cyrodiil, and calling for a champion to meet the challenge. At night, he sleeps in a bedroll in the garden; you can wake him up to talk with him. Speak to him about the Anvil chapel attack and he cryptically explains that a figure dubbed Umaril the Unfeathered is behind this plot, and that the only way to stop him is to use the Relics of the Divine Crusader, Pelinal Whitestrake. He then asks if you are a worthy knight. Depending on your ranking in various factions, you are given many options to respond. If you choose any "yes" answer, citing your accomplishments, he dismisses you, saying that you obviously do not need his help. However, the only way to progress forward in the quest is to seek the Prophet's help with humility, and choose any "no" answer, and then "How can I find the relics?". The Prophet explains that you must complete the pilgrimage of the Wayshrines of the Nine Divines to prove yourself and repent for your past misdeeds. He gives you a map detailing the locations of some of their respective Wayshrines and you receive the rank of Pilgrim in the Nine Divines faction. To complete the pilgrimage, you must visit and activate one of each of the Wayshrines of each of the Nine Divines—Akatosh, Talos, Julianos, Mara, Kynareth, Stendarr, Zenithar, Arkay, and Dibella. To get the whole story, enter the Chapel. It is best to wait until after you have talked with the Prophet to explore the Chapel, because after you become a Pilgrim you are able to legally explore the entire chapel and legally take any items you find. You will find it desecrated, bodies strewn everywhere, and Ayleid letters scrawled in blood on the floor surrounding the altar. Within, you may find numerous books giving more backstory to Umaril and Pelinal, including The Song of Pelinal volumes one through eight, Shezarr and the Divines, and The Adabal-a. After you have performed sufficient research, exit the Chapel and begin your Pilgrimage. If you enter the chapel hall and search all the rooms, you will find the Conjuration skill book 2920, Frostfall. The Pilgrimage consists of visiting and praying at (activating) one wayshrine for each of the Nine Divines. All characters, even those without any Infamy points, must go on the pilgrimage. The Wayshrines page provides a complete list of all the wayshrines that can be found in Cyrodiil. The Knights of the Nine plug-in does not add any new wayshrines. 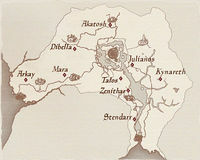 The "Wayshrines Map" provided to you by the Prophet shows the location of just one wayshrine for each of the Nine Divines. 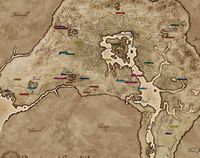 However, there is nothing special about those nine particular wayshrines; you can choose to visit any of the wayshrines (map) for each of the Nine Divines. On your pilgrimage, you might encounter Sir Roderic and his squire, Lathon. Roderic is also answering to the Prophet's call, and you have the option to accompany them to the wayshrines, but this method is incredibly slow and tedious. If your character has never gained any infamy and has previously visited any of the wayshrines, those wayshrines do not need to be revisited. If you are uncertain which wayshrines you have already visited, enter the chapel in any city except the desecrated chapel in Anvil. Around the perimeter of the chapel you will find small altars dedicated to each of the Nine Divines. Activate each one: if it provides you with a blessing, then you have already visited a wayshrine for that deity; otherwise, you will receive a message suggesting that you should visit a wayshrine. If you have already completed the Pilgrimage of the Nine Divines and received the Greater Power Pilgrim's Grace, you will need to visit a single wayshrine. When you activate it, you will immediately receive the vision from Pelinal that starts the next quest. When you have prayed at each of the nine altars, your Infamy points will be reduced to zero and you will receive a quest update stating that you have completed the pilgrimage and should pray and wait for a vision. The pilgrimage may be completed at any time, even outside this questline, to reduce your Infamy points to zero. It does not remove other aspects of a criminal past, however; guards will still recognize you as a murderer and may greet you accordingly. When your infamy is above zero, every shrine will give the same message, "Continue your penance to earn the gods' forgiveness." Continue to all nine shrines, with that same message each time, and at the ninth the message will be "Rejoice, You've completed the Pilgrimage of the Nine Wayshrines, and your sins have been washed clean!" Clearing your infamy has an additional consequence: when your infamy is set to zero, you lose the ability to use any of the Nine Divines' altars found in city chapels. This does not happen if your infamy is already zero when you complete the Pilgrimage. To regain the ability to use the chapel altars, you must visit the wayshrines one more time. If at any point during this questline you receive more than one Infamy point, you will have to complete the Pilgrimage again. You cannot complete the Pilgrimage while wearing the Gray Cowl. Any attempt to activate a wayshrine will result in the prompt: "The gods are not mocked! They require an honest heart, not one hidden behind a false face." 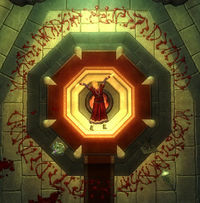 The Dwemer runes written in blood on the chapel floor read "As oiobala Umarile, Ehlnada racuvar" which The Prophet will tell you is Ayleid for "By the eternal power of Umaril, the mortal gods shall be cast down". After talking to the Prophet you may encounter Sir Roderic and Lathon on the road, completing their own pilgrimage. You can talk to them about the pilgrimage or even travel with them, but interacting with them is not necessary. It is not possible to clear your infamy without the Knights of the Nine plug-in installed. Without the plug-in, visiting all of the Wayshrines awards you with the greater power Pilgrim's Grace. It is possible to pickpocket all three Wayshrines maps from the Prophet, though if you ask him about the Pilgrimage he will still give you a map, since the script doesn't check whether he has them or not. These are the statements that the Prophet says when he asks if you are a worthy Knight. "Yes, I am a worthy knight": Then I'm sure you will have no trouble finding the Relics on your own. You clearly need no aid from man or god. Why do you come to me for aid, worthy knight? "Yes, I am the Hero of Kvatch": Well then, "Hail, Hero of Kvatch!" Let me add one more voice to the neverending chorus of praise. I'm sure one of your many devotees will able to guide you on your way to find the Crusader's Relics. "Yes, I am the Champion of Cyrodiil": And never let anyone forget it, Champion! I salute you. This small matter of the Crusader's Relics should be a trifle for a legend such as yourself. "Yes, I am the Fighter's Guildmaster": I apologize for even asking the question, most esteemed Master. Please, do not allow me to interrupt your quest for the Relics. "Yes, I am the Archmage": And a worthy successor to Hannibal Traven, I have no doubt. I'm sure your arcane arts will locate the lost Relics for you in no time. "No. I serve Sithis": Indeed. And yet you would seek the holy Relics? The gods will find you an interesting plaything, I have no doubt. "Not unless the Gray Fox is a knight": An honest thief? I'll leave it to the priests of Zenithar to debate that paradox with you. "No. I have no claim to fame" (if you have any infamy): Let the gods be the judge of that. I cannot see into men's hearts. I see only their words and deeds. "No, I have no claim to fame" (if you have no infamy but do have fame): A humble heart is a good starting point. The gods will decide if you are worthy to seek the Relics. "No, I have no claim to fame" (if you have neither infamy nor fame): Perhaps, perhaps not. What men value is not always what the gods look for in a champion. Pelinal Whitestrake's dialogue may cut out half way through a sentence. What causes this is unknown. One shrine may identify itself as belonging to a different god (e.g. It may say Dibella at one of Arkay's). You will need to go to another wayshrine of the god to get the blessing. If you enter the chapel before speaking with the prophet, it is possible that none of the bodies will show up in the chapel. As you go through this quest for the first time, the "Prophet" topic will be available for almost every male NPC (barring Bretons and the Daedric races) and all female Imperials in the game, including those created for the Shivering Isles expansion and the other official plug-ins. Strangely, the female Bretons do not have the same topic available, nor any dialogue relating to this plug-in, even though they have the same exact voice actress and voice type as the female Imperials. Also, all NPCs with this option speak with dialogue that will suggest that you go to Anvil and visit the Prophet yourself, even though you would have already done so at that point. Even though the message "Topic added: Prophet" can appear on the screen if you overhear other NPCs discussing what happened in Anvil before you even go there, you won't receive the option to discuss this topic with others until you've already spoken with him and started the Pilgrimage quest. 6 I've heard rumors of an attack on the Chapel of Dibella in Anvil. No one seems to know what happened, but all the priests and priestesses were killed and the altars desecrated. It might be worth going to Anvil to see for myself. 9 I've spoken to the Prophet outside Anvil Chapel. He claims that an ancient Ayleid sorceror-king has returned from beyond the grave to destroy the church, and that only a true knight wearing the legendary Crusader's Relics can possibly defeat him. I should speak to him further to find out how to find these lost Relics. 10 I've spoken to a mysterious Prophet, who told me that in order to seek the Relics of the Crusader, I must first do a pilgrimage to the Wayshrines of the Divines. He gave me a map of the Pilgrim's Way to help me locate the shrines. Once I have visited a wayshrine for each of the Nine Divines, I may receive a vision if I am judged a worthy knight. 20 I have completed my pilgrimage to the Wayshrines of the Divines. I should pray and wait for a vision to guide me on my quest for the Crusader's Relics. It is possible to use the console to advance through the quest by entering setstage NDPilgrim stage, where stage is the number of the stage you wish to complete. It is not possible to un-complete (i.e. go back) quest stages. See SetStage for more information.